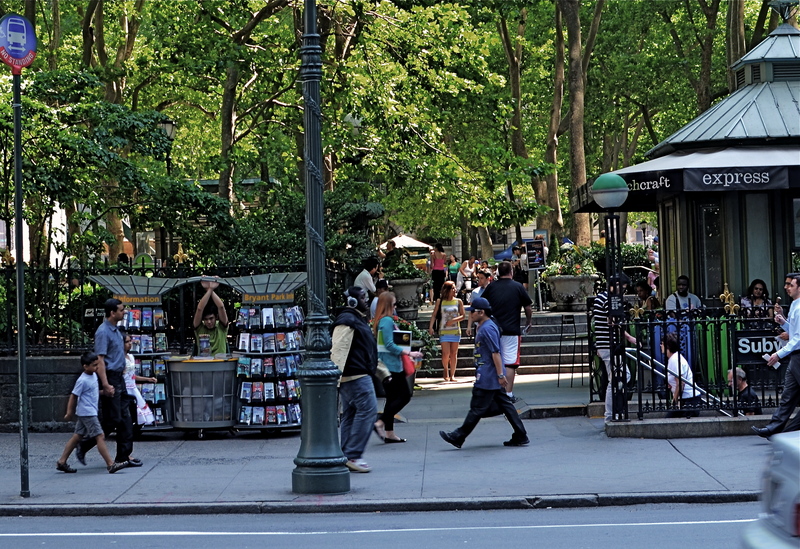 Bryant Park Tableau, 2013. 1/100 sec., f/5.6, ISO 100, 35mm. WHO CAN SAY WHY SOMETHING CALLS OUT TO US VISUALLY? I have marveled at millions of moments that someone else has chosen to slice off, isolate, freeze and fixate on, moments that have, amazingly, passed something along to me in their photographic execution that I would never have slowed to see in the actual world. It’s the assist, the approach, if you will, of the photographer that makes the image compelling. It’s the context his or her eye imposes on bits of nature that make them memorable, even unforgettable. It’s occurred to me more than once that, given the sheer glut of visual information that the current world assaults us with, the greatest thing a photographer can do is at least arrest some of it in its mad flight, slow time enough to make us see a fraction of what is racing out of our reach every second. I don’t honestly know what’s more fascinating; the things we manage to freeze for further consideration, or the monstrous ocean of visual data that is lost, constantly. There’s a reason photography has become the world’s most loved, hated, trusted, feared, and treasured form of storytelling. For the first time in human history, these last few centuries have afforded us to catch at least a few of the butterflies of our fleeting existence, a finite harvest of the flurrying dust motes of time. It’s both fascinating and frustrating, but, like spellbound suckers at a magic show, we can’t look away, even when the messages are heartbreaking, or horrible. We are light thieves, plunderers on a boundless treasure ship, witnesses. Assistants to the seeing eye of the heart. This entry was posted on January 5, 2014 by Michael Perkins. It was filed under Composition, Environment, P.O.V., Perspective, Photojournalism and was tagged with Candids, Composition, creativity, Philosophy, Viewpoint.